The school holidays are drawing to a close and I feel that I've barely seen my kids with this last week taken up with basketball camp and the week before they had lots of social activities. Today, though, we've enjoyed a lovely quiet day together and this afternoon have snuggled up on the couch watching a movie. Such a treat. This morning I finished a piece I've had waiting to be painted for ages. I painted this beautiful old French breakfront sideboard - with serpentine drawers - in a soft grey and I used white for the details as I so often do. The piece has been waxed for a silky smooth finish. This sideboard is very old and has a few small bits of damage as you could expect of something of it's age. There are some chips to the timber flange on the top and also at some stage of its life there has been some damage to it's legs but that's all been repaired long before my time and it's structurally sound now. Solid timber and with beautiful details. This piece is a perfect statement piece for your home. It's for sale - please email me on lilyfieldlife@bigpond.com for details and photos. I lvoe these grand old pieces - wearing their history and age with pride! wow- that is a stunning piece! Thank Cassie, I've had this one for ages waiting to be painted! What a beautiful old grand piece now that you have transformed it! Great job! Thanks, I love it now. Amazing how much paint transforms things isn’t it. This is such a gorgeous. I am drawn to french style furniture. Really beautiful and sophisticated Fiona! 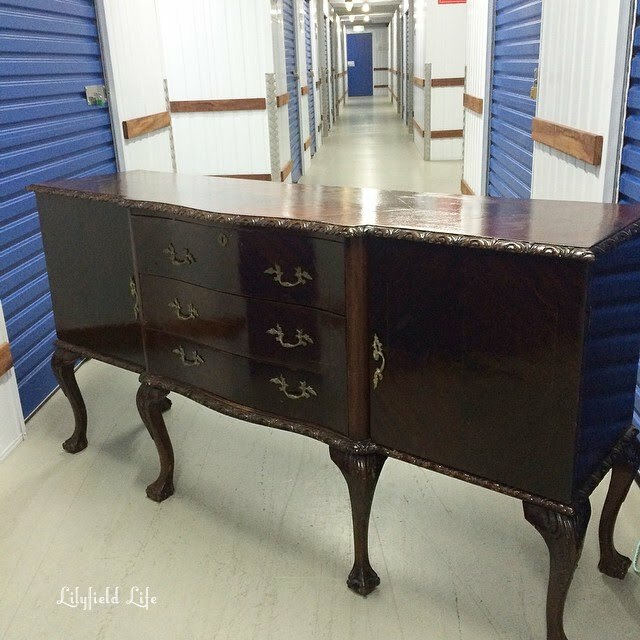 Do you have a whole storage unit filled with furniture? Featured you at Be Inspired this morning. Thanks so much for sharing! It's simply beautiful Fiona - what a gorgeous transformation !! !